Shortly after my relocation to Alabama, I was given the opportunity to oversee the competition preparation of a young powerlifter who had been training here at the AUM Human Performance Lab under the care of Dr. Mike Esco and his staff. He was about 5 weeks out from competition at the time of my arrival. Below is a detailed account of the training program with HRV data, training load and sleep score. 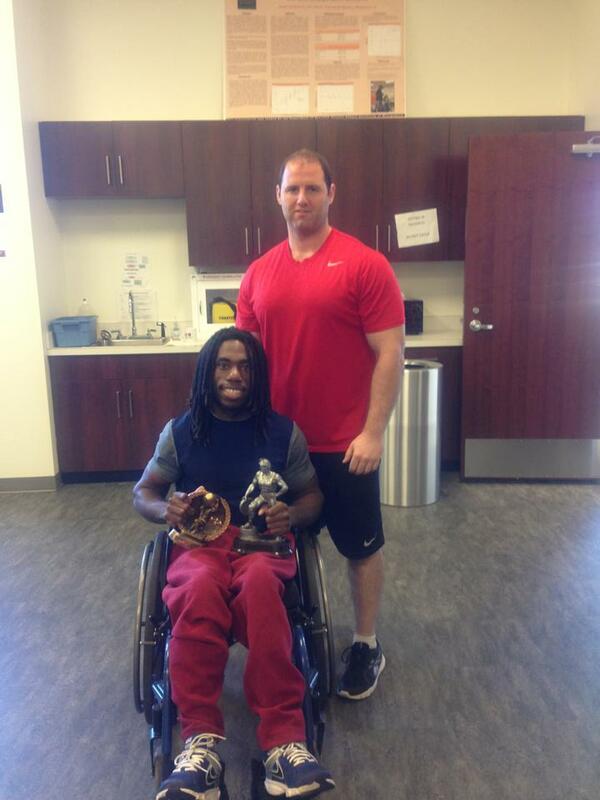 The athlete is a 22 year old male with Cerebral Palsy and can therefore only compete in the Bench Press. He competes in the 123lb weight class (actual weight is 121). His best competition lift was 200lbs recorded this past February at his first competition. After observing a couple of workouts, I could see that Zarius was missing out on some poundage due to technical flaws. The focus of the program was therefore to improve his bench press technique and get him more accustomed to the competition commands. We trained 3x/week and used a full body, undulating approach that enabled us to Bench Press each session to further develop technique. The original program is below and was followed with only minor adjustments here and there. The chosen sets/reps and percentages were inspired by those outlined Tri-Phasic Training. This allowed for the completion of only quality reps; avoiding failure and saving the grinding for competition. You’ll notice the corresponding rep ranges for each percentage are well below typical capabilities. (i.e. 85%x2 rather than 85%x5-6). Assistance work progressed in weight or reps each week based on performance. Beginning on day one of week one, the athlete recorded HRV each morning with ithlete on his iPod Touch in a seated position. Sleep was rated on a scale of 1-5 on the app. Training load was manually entered based on training intensity to make interpretation easier from the trend in relation to his HRV. Perceived values are not included. Below is all of the raw data as it appears when exported from the app into Excel followed by a recreation of his 4 week trend. 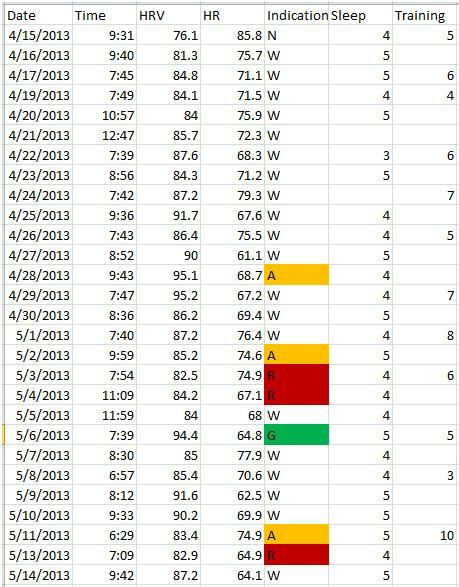 I’ve highlighted high and low HRV days in the respective colors used by ithlete. You’ll note that measurements are missing on two occasions; 4/18 and 5/12. 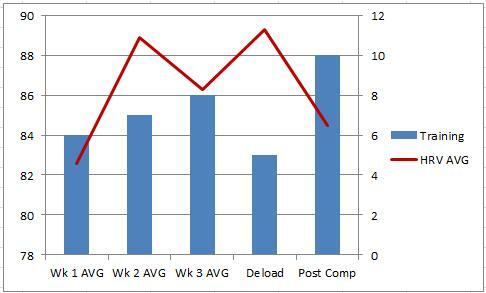 Below are images of his weekly averages of HRV and training load. Training load in this context is simply intended to represent a progressive increase in intensity followed by a deload and then competition. There’s a clear progressive increase in his HRV trend right up until the start of week 3. 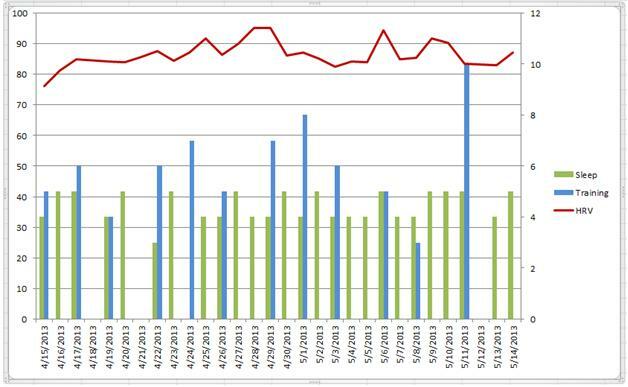 Week 3 was the highest intensity training week with a slight reduction in volume. It appears that intensity rather than volume created more fatigue. His HRV peaks during the deload week. The deload week included 2 workouts. On Monday we worked up to his opener of 240lb for a single and on Wednesday we worked up to 70% for a few singles with emphasis on the competition commands and pausing. You can see that the morning of the competition (5/11) there is a small drop in HRV. I attribute this to pre-competition anxiety based on feedback of mood, perception, etc. He appears to have slept well leading up to the meet. HRV remains suppressed until the 3rd day after the competition where it starts to trend back up, however still remains below average. This clearly shows the additional psychological/emotional stress that competing places on the body. He added 50lbs to his competition best since February. His next meet will be in October where he’ll be looking to shorten the gap he has to close to fulfill his dreams of qualifying for the Paralympics. This entry was posted in Heart Rate Variability, Monitoring and tagged Case Study, Cerebral Palsy, heart rate variability, HRV, powerlifting. Bookmark the permalink. Awesome Job, both of you.